You are left with a memory of thrills and spills, daring and speculation, worlds visited and obstacles overcome. Beat Circus have provided one of the highs of the year. 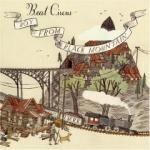 Boy from Black Mountain is the third Beat Circus album and the second part of bandleader Brian Carpenter's "Weird American Gothic" trilogy. If that phrase brings to mind the "old weird America" that Greil Marcus has written about, then the connection is justified. Carpenter's music finds resonance with the Band's carnival aesthetic via a combination of eclectic instrumentation, vaudeville styles, and narratives about circus and carnival life. There are numerous hints of the "invisible republic" that Marcus identified in the Band's music and in the early hillbilly and race records collected on Harry Smith's Anthology of American Folk Music. Like Smith, Carpenter is equally drawn to the avant-garde as he is to the old, rural, and gothic. He has interests in free jazz and improvised music, film directing, and radio broadcasting, and seeks ways to connect these interests into a wide vision. Under the Beat Circus name, Carpenter has produced skewed circus music that trace lineages between Congo Square jazz, the music of the medicine shows, and Balkan brass. If the idea of circus suggests a bringing together of disparate spectacles in one site, then this group's music lives up to its name. The first Beat Circus album, 2004's Ringleaders Revolt, was an instrumental soundtrack to an imagined circus, the show's freakish elements underlined by jazz/improv freak-outs. The follow-up, Dreamland, themed after the Coney Island entertainment park of the same name, brought sophisticated arrangements and songs to the mix. Boy from Black Mountain is influenced by familial themes rather than the traveling life, but it retains a strong sense of place. It is the most immediately catchy of the group's albums to date, while still presenting a varied and sophisticated musical palette. These features are apparent on the opening track, "The February Train". The first sound is Carpenter's harmonium, then strings enter with a hypnotic melody that itself is soon countered by deep brass. Suddenly the melody changes, all the instruments working together along with drums to introduce the melodic line of the song in a manner that brings to mind Egyptian string music. Carpenter adds a vocal to this mixture, his voice soaring with deep yearning as he sings of a land "where everything's true but nothing's real". There is certainly something to the comparisons that have been made between Carpenter's voice and Nick Cave's, but Stuart Staples of Tindersticks provides a closer comparison here. The Cave-like (or cavernous?) voice is more on show in "The Life You Save May Be Your Own", a frantic Southern Gothic boogie that mixes freight-train harmonica, rockabilly guitar, brass stomp, and a heavenly choir. At the end of this breathless journey lies the title track, a masterpiece of childhood fantasy to rival John Stewart's "The Pirates of Stone County Road" and David Ackles's "Subway to the Country". Like those songs, it recalls a place where geography and imagination meet, a territory of the mind where anything may be possible. "Boy from Black Mountain" is inspired by Carpenter's response to his son's autism, and functions as both a hymn to the understanding of that condition and a reminder to take children's imaginative journeys seriously. The lyrics of "Black Mountain" evoke a magical realist domain haunted by Buffalo Bill and Jonathan Swift, where a child can fly through the air and find "no enemies inside the dream". As Carpenter sings of the boy who "soared over trees with the greatest of ease / like that daring young man on the flying trapeze", there is a reminder that the space of the circus -- Carpenter's constant motif -- is also a site of magic, a liminal space where dreams can come true. The dynamics at play in this piece -- Carpenter's yearning vocal, the dramatic instrumental changes, and the overall sense of innocent speculation and otherworldly magic -- recall nothing so much as Neutral Milk Hotel's majestic In the Aeroplane Over the Sea. The world summoned up in these narratives is not just Greil Marcus's "invisible republic", but a wider world of uncanny magic as evoked by the Handsome Family or the television serial Carnivàle. The positing of magical realism in the American South goes back at least to Edgar Allen Poe, but its 20th century evocation is perhaps most closely associated with William Faulkner, a guiding influence on subsequent magical realist writers like Gabriel Garcia Marquez (another author fascinated by circuses). It comes as no great surprise, then, when Beat Circus name one of their tracks "As I Lay Dying", a title taken from Faulkner. What is less expected is to find that it's an old-time hoedown, matching the doom-laden lyric ("Who will remember me as I lay dying?") to a frenetic sing-along chorus, high-speed banjo, and square-dance fiddle. Midway through, handclaps and choral testifying convert the song to a feisty spiritual outlining the road to redemption. Equally infectious is "Petrified Man", a track which, for its first 45 seconds, might find a place on Harry Smith's anthology, all deep, doomed vocals and skeletal banjo. The chorus adds drums, backing choir, and a sense of calculated arrangement not found in Smith's selections. Similar sophistication is found in "Saturn Song", another piece inspired by Carpenter's son, which places a lyric about the discomfort felt by supposedly "good people" towards a "boy from Saturn" with an arrangement that asks American banjo to mix with Eastern-inflected violin and cello. What can't be achieved in the world of the lyrics is made eerily beautiful in the music. Singer-sngwriter Larkin Grimm accompanies Carpenter on this track. "The Quick and the Dead" finds Carpenter at his most Johnny Cash-like as he delivers an uptempo gunfighter ballad. Towards the end of the song, Carpenter-Cash morphs into Carpenter-Cave and the world of American Gothic returns to its dominant position, as if to prepare us for subsequent track,"The Sound and the Fury". But it's a trick: the title may come from Faulkner again, but the music is radically different than anything else on the album. Over an ominous bass note introduced by the cello, a violin introduces a high-pitched, Middle Eastern melody that Grimm sings along to. Screeching saxophone enters, bringing a soundworld that is dissonant to that employed so far on the album. A jazz bassline is then accompanied by disembodied voices chanting in an unrecognizable language. The result is an edge-of-consciousness music -- trance-like, ritualistic, trippy, and unsettling -- more akin to the mid-20th century exotica of Les Baxter, Martin Denny, and Arthur Lyman than to any obvious Americana precursors (though Screaming Jay Hawkins and Dr John may be on hand to dispute such a claim). It's as though, wandering around familiar carnival tents, you lifted the flap of an unmarked tent and witnessed a spectacle that questioned everything you though you knew. Following this unsettling encounter at the carnival's edge, Beat Circus return us to the by-now Old Familiar America for the religious number "Judgment Day", the dreamy instrumental "Lullaby for Alexander", and the unexpected but thrilling heavy rock of "Nantahala", which channels a similar cosmic Americana to that explored by Six Organs of Admittance and Comets on Fire. Then the fairground ride is over. You are left with a memory of thrills and spills, daring and speculation, worlds visited and obstacles overcome. Do you turn for home or go back in, hoping to stop time for just a little while longer? Whichever you choose, there's no doubt that Beat Circus have provided one of the highs of the year. Precisely what carnival should deliver.